I recently learned to work with fine silver clay (PMC). I’m able to roll it out on different textures, squirt through a syringe, and press into molds I’ve made of everyday objects like buttons. Traditional metalworking seems so time-consuming and limited in comparison! PMC dries quickly, so I’m learning how to keep the excess clay wrapped in plastic while I’m working. After I finish a piece, I let it dry on an electric mug warmer. Then I sand the rough edges with an emery board and fire in a digital kiln at 1260ºF for 10 minutes. The photo shows what the pieces look like when they’re finished firing. You can see the aqua CZ ring at front-left and the wizard ring to its right. Only certain stones can withstand the heat of the kiln, and because CZs are lab-created under high heat and pressure, they are good candidates for firing in place. 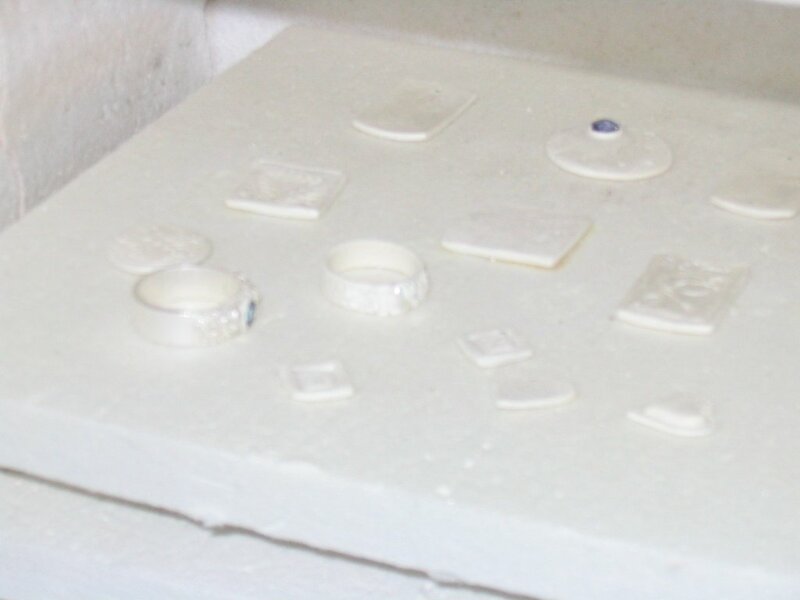 Other stones can be set after firing, but the settings are less integrated with the design. Rings are tricky because the clay shrinks a little when firing, so I have to do a little math in order to make a specific ring size. The newly-fired pieces are white because the binder has burned away, which leaves the surface of the silver like that of a sponge. I take a steel brush and smooth out the top layer, which results in a matte finish. Finally I oxidize (blacken) the silver to bring out detail, and burnish the high spots to leave them bright and polished. Yesterday I made my annual pilgrimage to Lapidary Journal’s Beadfest in Fort Washington, PA. It is one of the largest jewelry supply trade shows in the country and I never get to see all the booths before it’s time to leave. It never ceases to amaze me how one can fit thousands of dollars worth of beads and tools in a tote bag. Last night I would close my eyes and see beads; I even dreamt of beads. I challenge you to engage me in a conversation topic other than jewelry! Check out these artisan lampwork beads that just came in the mail. So fun! This is a medium with which I am completely fascinated at the time. Right now I have only book knowlege, but I plan to take a lampworking class after the holidays to see if it’s a technique I’d like to pursue. 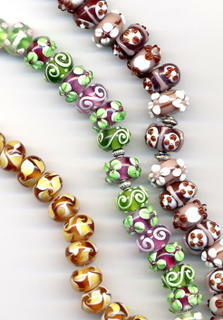 Lampwork is also called flamework, which is a bit more descriptive. The glass artisan heats rods of glass in a very hot flame (usually an oxy-propane torch), melting it to resemble the consistency of taffy. He or she then winds the molten glass around a thin steel rod called a mandrel. The different-colored layers of glass can be poked, twisted, swirled, or even rolled in colored frit (glass crumbs) to get a speckled appearance. Sometimes the entire colored bead is covered (encased) in clear glass to give the piece depth like a paperweight. If you don’t see a class listed that you’d like to take, just email me and I can teach you privately. I met with one of my favorite clients today, Lauri Crothers at The Silver Buckle in North East, MD. Love her. It’s funny how I still get nervous when meeting with buyers. My designs are kinda personal, and I’m putting myself out there when presenting them for others’ critique. I’m working on distancing myself so that I don’t get too emotionally involved. Nonetheless, I still get really excited when people like my stuff, like today. Thanks, Lauri! We live in a 140-some-year-old house, the third floor of which is my studio. The main part of the house has central heat and air, but there is no ductwork in the studio to keep the temperature regulated. Add to this the huge skylights and small layer of insulation between the ceiling and roof, and my studio turns into a sauna in the summertime and a walk-in fridge in the winter. We considered installing a window air conditioner, but the lone vertical window is too small to accommodate one. After moving my work area to a card table in the foyer for the summer and browsing online for a portable A/C unit, I happened upon a solution: a through-the-wall air conditioner/heater. Steve and I are all about DIY home repair, but something about cutting a hole in the side of the house and the resulting exterior caulking job 3 floors off the ground was a little too daunting, so I’ve called to get estimates from professionals. Meanwhile, during the cooler weather I’ve begun to move my mess back up to the studio. 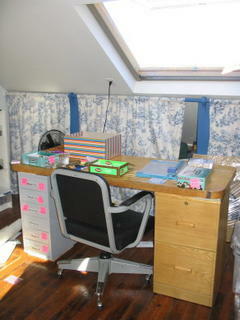 I even have a new work surface! Our friend Mitch is fixing up a house and gave us the old butcher block counter from the kitchen. Pair that with an orphan file cabinet under one end and a new Ikea drawer unit under the other end and now I’ve got another great new spot to work. The piece de la resistance is that I took my handy router and cut long grooves in the surface for a built-in design board. I’m in the middle of loading my fall collection of jewelry onto my website. It takes a while to scan everything and write descriptions, plus if you’ve been to my site before you may have noticed a color change from the ol’ periwinkle and lime. Let me know what you think!